Alcoholic beverages have been enjoyed for thousands of years and have been appreciated for their taste and pleasing effects. They also have been used as food, providing nutritional value to the diet. 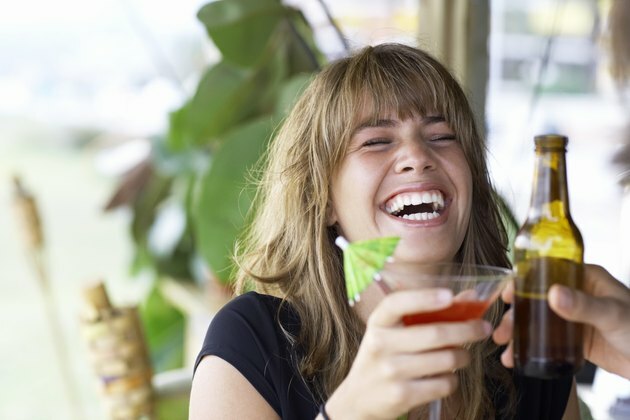 Those who drink alcoholic beverages can gain some benefit from enjoying one or two drinks on a daily basis. As with any part of a healthy diet, moderation is the key to success. The caloric value of alcohol is high. When alcohol is ingested, the liver metabolizes the alcohol, turning it into acetate. This chemical is effectively used as a fuel source within the body. A single shot (1.5 ounce) of hard liquor contains between 100 and 200 calories. Beer and wine average around 150 calories per serving. Sugary mixed drinks can range from around 300 calories for a gin and tonic to over 800 calories per serving for creamy, frozen beverages. Alcohol itself has no vitamins or minerals. Therefore, the higher the alcohol content of a drink, the lower the amount of available nutrients. A 12-ounce serving of beer provides around 8 percent of the recommended daily intake of vitamin B6 and niacin, 5 percent of riboflavin and folate, and trace amounts of other nutrients. Unfiltered, craft beers are more nutritious than highly filtered commercial beers. Wine offers less in the way of nutrients, with 4 percent of the required amount of B6, only traces of other vitamins and small amounts of iron, magnesium, potassium, manganese and phosphorus. A single shot of 80-proof hard liquor contains virtually no vitamins or minerals. The only benefit that may be gained from hard-liquor drinks will come from mixers (such as juices or milk) that may have some food value. Most alcoholic beverages contain little or no fat or sodium. Protein levels are also low. A serving of beer has no fat, less than 2 grams of protein and trace amounts of sodium. Wine and hard liquor contain no fat, protein or sodium at all. Mixed drinks vary, but generally have low levels of fat, protein and sodium. Exceptions do exist, however, such as a salt-rimmed margarita with a significant amount of sodium or a piña colada that derives its creamy flavor and texture partly from coconut oil. Many studies have been conducted to consider any potential nutritional benefits that alcohol itself may play in a healthy diet. The National Institute on Alcohol Abuse and Alcoholism concluded that moderate drinkers have the highest longevity within the general population. The organization also reported that cardiovascular health improved in individuals who drank alcohol occasionally. A study published by the American Heart Association indicated that nondrinkers had twice as high a chance of suffering a stroke as moderate drinkers. Still other reports show that the effects of hypertension, diabetes, Alzheimer's disease and a list of other illnesses and disorders were improved with occasional alcohol consumption. Alcohol also increases "good" HDL cholesterol in the body. Red wine contains antioxidants known as polyphenols. These chemicals act within the body to reduce levels of free radicals (chemicals that damage cells). In particular, Resveratrol, a powerful antioxidant in red wines, has been identified as helping to prevent damage to blood vessels, reducing "bad" LDL cholesterol and preventing blood clots.